Magic Owl is a game of exploration and musical interaction. There are no goals or points to win; fly around and the space will interact visually and musically, generating a soundtrack as you play. The game is intended to be a relaxing and peaceful experience of discovery. 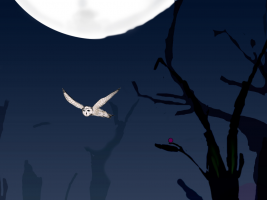 This was made for the MAGS competition in November 2013, with the theme "night time". "Excellent use of dynamic sounds, music & animation make for an enjoyable though extremely brief artsy experience." Too cramped. Not enough space to explore to make it anything more than a demo. Beautiful idea, for the eyes and ears. An atmospheric and interactive piece of art. It's not a game but it's an interesting musical experiment. Also an impressive first release by Emont!